PNNL’s new approach to studying clusters of electrically charged molecules may hold the key to understanding the behavior of these ions in solution, in solids, and at interfaces. Copyright 2017: American Chemical Society Enlarge Image. The electric charge of atoms or molecules zaps science's ability to predict how these ions will behave when combined with others. Different ions with the same charge cause different effects. How an ion behaves when isolated under an analytical instrument can differ from how it behaves in the environment. Now Dr. Xue-Bin Wang at Pacific Northwest National Laboratory (PNNL) is bringing ions and molecules together in clusters to better discover their properties and predict their behavior. 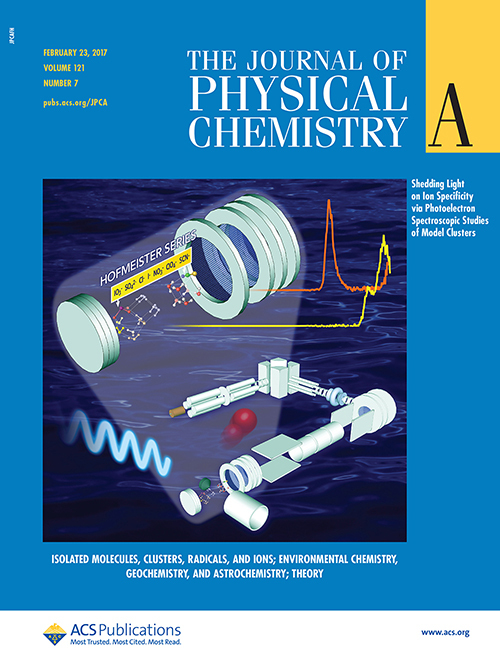 The invited feature article was published in The Journal of Physical Chemistry A, noted on the cover, and awarded the American Chemical Society's coveted Editors' Choice. "Our cluster model studies provide detailed information important to understanding how chemicals transform in the atmosphere and biology functions," said Wang, PNNL chemical physicist. "Such studies can help develop sustainable energy and synthesize new materials." Why It Matters: When it comes to chemistry, it's all about the edges. Forcing two substances, such as water and salt, to interface effectively for a given purpose can be surprisingly complex. Scientists and engineers must be able to reliably predict how electrically charged ions will respond when atoms come together, whether in biological or human-made systems. Ionic clusters represent an ideal way to model such larger-scale systems because they provide model systems to mimic chemical and physical processes in bulk and at interfaces. By studying clusters, scientists can better understand electrolytes that affect human biology, aerosols that influence climate, and chemical building blocks that could lead to breakthroughs in new materials. 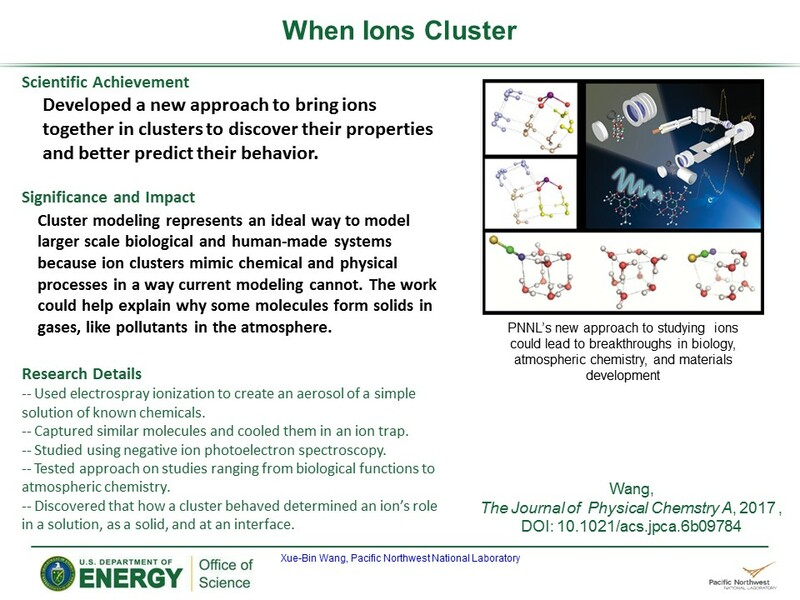 Methods: Wang theorized that clusters might hold the key to understanding the behavior of certain types of ions, so he and his team developed a unique approach to create them. They started with a simple solution of known chemicals, then applied a high voltage to create an aerosol. This electrospray ionization kept similar molecules together so that scientists could capture and cool them in an ion trap. Controlling temperature not only allowed scientists to study how the ions behaved with temperature changes but surprisingly improved the results from the spectrometer they used to study the clusters. They have employed their cluster model approach on a number of studies from biological functions to atmospheric chemistry. In all cases, they found that how the cluster behaved was a function of the size and composition. The overall behavior of a cluster helped determine the ion's behavior in a solution, as a solid, and at an interface. The work could help explain why some molecules show markedly different behavior as a liquid or a solid and why some molecules form solids in gases, like pollutants in the atmosphere. What's Next? Wang and his collaborators are extending their analysis to more complex ions, a wider range of temperatures, and larger clusters to find the optimum approach to model chemical and physical processes. Such work could allow scientists to investigate the ion-specific effects on the proteins and peptides used in biological functions and material synthesis. Sponsor: The U.S. Department of Energy's (DOE's) Office of Science, Office of Basic Energy Sciences, the Division of Chemical Sciences, Geosciences, and Biosciences supported this work. Reference: Wang, XB. 2017. "Cluster Model Studies of Anion and Molecular Specificities via Electrospray Ionization Photoelectron Spectroscopy." The Journal of Physical Chemistry A. DOI:10.1021/acs.jpca.6b09784. Scientists at PNNL employed a cluster model approach to studying electrically charged molecules, which could lead to better understanding of and breakthroughs in biology, atmospheric chemistry, and materials development.